I’m sure all girls have a dream to become as beautiful as the Barbie, for she is so beautiful. No matter you are a little girl or having grown up, you still want all kinds of Barbie dolls in your bedding, and hug them when you are sleep. We know that most of the dolls are the same girl, but in different clothes and hairstyle, you can change clothes and hairstyle as you like. The Barbie is in an adult appearance, they not only have a range of clothes and accessories, but also have a large range of Barbie branded goods such as cosmetics, books and so on. The original Barbie was launched in March 1959. The founder of the barbie is Ruth Handler, she get the idea of making this kind of doll from her daughter. She saw that her daughter Barbara played with paper dolls, and noticed that she often enjoyed giving them adult roles. At that time, most children’s toy dolls were representations of infants. Realizing that there could be a gap in the market, she decided to make a kind of doll that can match kids’ needs. 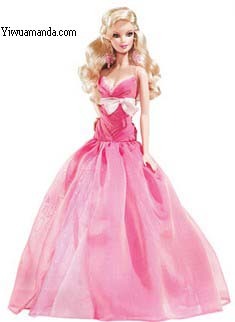 Now Barbie has become a cultural icon and has been given honors that are rare in the toy world.